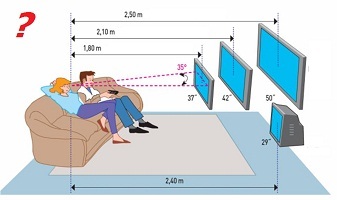 What size TV and wall mounting distance? What size TV should you have for the size of your room? Go for as big or small as you want! So simply, bigger is better than smaller if you were unsure. If you think you might be going too big? Then check this out! 200 inch screen in bedroom! You can't go TOO BIG! Well at least we think so anyway. By clicking on the link above you'll see a 200inch projector screen installation we did in a bedroom. It was amazing to say the least. Bigger really is better in our opinion. Therefore if you have the room, you just can't go too big. Going too small on the other hand is a mistake alot of people make! !